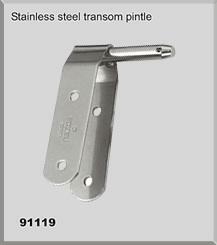 Stainless Steel Transom Pintle, 3/8" diameter pin, Sold as a set of upper & lower pintle. One pintle has 1" long pin below attachment strap, the other has 1-1/2" long drilled pin below attachment strap. The strap attachment is 3" long by 1" wide 1/16" thick, with two #10 attachement holes.